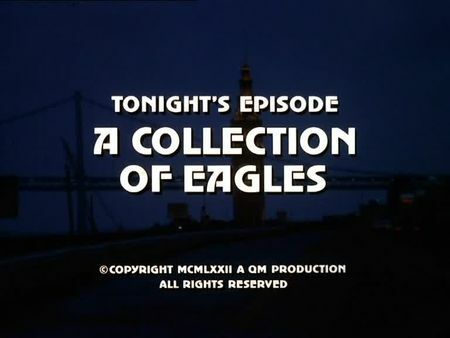 I have just added the screencaps for A Collection of Eagles to the episodes' page. Vincent Hagopian, a second generation coin dealer, plans to replace a set of rare 'Double Eagle' coins in a richman's collection by duplicates he is producing himself. After killing one of his henchmen and with homicide stuck in the investigation of another murder in a shabby waterfront hotel - where Steve discovered a gold coin workpiece - Hagopian is questioned by Stone and Keller as an expert. Soon after, Steve discovers that the alleged expert did not mention a decisive detail in the listing of collectors and customers he provided. With the rare coins already exchanged, Hagopian reveals his evilness as he is also about to kill the young girl who helped him getting access to the original collection. Police arrives just in time to save her life and to detain the greedy murderer. This episode starts in one of the typical 1970's waterfront hotels right beneath the Embarcadero freeway - the now demolished Embarcadero Hotel, to be precise. Filming locations also include the Coroner's Office at the San Francisco Police Department, Hagopian's coin shop in Maiden Lane as well as Union Square, and Washington Square. Quite interesting, by the way, there is a certain focus on crime lab procedures and securing of evidence in this episode as Mike and Steve are frequently consulting Charlie Johnson, the leading lab technician, for the latest results and demonstration of up-to-date crime lab techniques.